When a book has a title like First Draft in 30 Days , it can be hard to pass up. If it’s sitting on the shelf at your local library, passing it up is practically impossible, which is why I picked Karen Wiesner’s book. 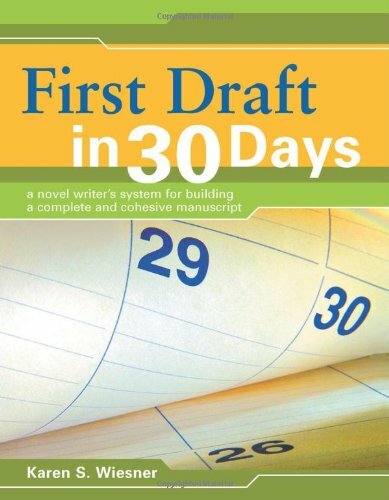 The idea that I could write a first draft, or in Wiesner’s case, an incredibly detailed outline (which she equates to a first draft), is seductive. So far, it hasn’t happened yet (mostly, because I’m currently writing the second draft of another work) but the dream remains. Good for the plotter of plotters. Researching 17th-century farming practices and then getting lost on Google can be a common occurrence, which is why I love the research list. The idea behind the research list is that you jot down things you need to research while you outline and then research them on days set aside for the task. This is great because it allows you to stay focused on the task at hand without worrying about forgetting all of the things you still need to look up. At some point most of us fill out character bios, but Wiesner has turned this into a step in her 30-day plan, calling them sketches. What I like most about this is that they’re steps in the process and filling them out forces you to think not just about your character, but your locations and how both fit into the story. Wiesner’s template for a location sketch is also quite good. Weisner’s 30-day plan is incredibly intricate, with steps such tagging the tension in a scene. If you’re the plotter of plotters this level of detail may work for you, but there’s still a little pantsing in my process and this feels like hard work. At the end of the 30 days you should have an incredibly detailed, scene-by-scene outline. Unfortunately the outline’s suggested format feels unwieldy, even in Scrivener. For me it includes too much information most of which I either won’t use, will change or will get in my way, leading to all sorts of frustrations. If you’re the kind of person who likes to plan everything to the nth degree you’re going to love First Draft in 30 Days. Track down a copy now and devour it. If you’re even a little bit on the pantser side of the scale you’ll still find things to love, but the entire process won’t be for you. Take what you like and add it to you’re own writing method.